"It sends a message to the Hispanic community that we intend to racially profile you," said an immigration attorney. The warrants used by immigration agents for civil violations of immigration law are called "administrative" warrants, and only need to be signed by immigration agents, unlike criminal warrants. One of the attorneys filing suit, Mark Fleming, associate director of litigation at the National Immigrant Justice Center, says he believes many of the kinds of arrests that ICE is making under President Donald Trump are completely new. Under the Obama administration, ICEtargeted undocumented immigrants convicted of serious crimes, gang members and national security threats. Obama stilldeported more people than any previous president. But as White House press secretary Sean Spicersaid in Feb. 2017, Obama's successor has "take[n] the shackles off" ICE, expanding the scope of removable immigrants to include anyone in the country illegally. Trump's Jan. 25, 2017executive order, one of his first actions as president, stopped exempting "classes or categories of removable aliens from potential enforcement." Plaintiffs in the class-action suit say that the Trump administration's aggressive tactics are also ensnaring non-criminal immigrants who are detained and questioned without warrants and without probable cause. For ICE to make a warrantless arrest, agents need to have "reason to believe" that the person is in the country unlawfully and is "likely to escape" before ICE can obtain a warrant, according to federal immigrationlaw. The class-action was filed against ICE and the Department of Homeland Security on behalf of likely more than 100 people arrested and detained by ICE without warrants or an established flight risk in a seven-day period near Chicago. Four of the five plaintiffs named in the complaint do not have criminal records, according to the complaint. Fleming said that in the case of Margarito Castañon Nava, ICE had no reason to believe he was in the country illegally or was a flight risk when they stopped him. Castañon, a construction worker, says he was heading home with a co-worker on the afternoon of Sunday, May 20, 2018, after finishing work, according to his declaration. A 17-year resident of the U.S. with no criminal record, Castañon, 42, was driving his truck through a Chicago suburb. Then, unmarked cars driven by officers in street clothes pulled him over. Although he first thought the officers were local police, Castañon later found out they were ICE agents. They didn't give Castañon or his passenger, also Latino, a reason for the stop and didn't have a warrant, according to his attorney. Another car pulled in 10 minutes later and Castañon observed officers in generic vests that said "POLICE." He and his passenger were arrested, but only told the arresting officers were ICE agents when they arrived at an immigration building. "The only thing I could think during this whole time was that they had pulled us over to see if we had immigration papers because both my co-worker and I appear Hispanic," Castañon said in a court filing. Counsel for ICE and DHS declined to comment on a list of questions sent by NBC News, citing the pending litigation. Counsel did provide a copy of a warrant dated May 20 for Castañon arrest, but Fleming says the warrant was written after ICE stopped Castañon. ICE's complaint did not specifically dispute this claim, saying that the warrant was "issued on the same day as their arrests." ICE counsel did not respond to repeated requests for confirmation. ICE declined to comment on specifics of the case because it said it won't comment on pending litigation. "Lack of comment should not be construed as agreement with or stipulation to any of the allegations," ICE spokesman Matthew Bourke wrote in an email. In addition to warrantless arrests,Fleming said that large-scale collateral arrests — arrests of immigrants not initially targeted by ICE — have become common for the first time since the George W. Bush administration. Immigration rights advocates say these collateral arrests have been particularly prevalent in sanctuary cities, locales that limit their cooperation with federal immigration authorities. ICE officials have said that the posture of sanctuary cities has forced them to change enforcement tactics. In response to California's state law, then-ICE director Thomas Homansaid in October 2017 that the policy would leave ICE with "no choice but to conduct at-large arrests in local neighborhoods and at worksites, which will inevitably result in additional collateral arrests." Thelawincludes a provision that prevents state and local law enforcement agencies from honoring ICE detainers, meaning they do not hold individuals arrested on non-immigration-related charges for delivery to ICE. "While the vast majority of cities in America do cooperate with ICE, others like San Francisco and Oakland force ICE to focus additional resources to conduct at-large arrests in the community … increasing the incidents of collateral arrests," said a February 2018 ICE press releaseread. Castañon was swept up in six-day sweep that ICEsaid resulted in 156 arrests near Chicago,a sanctuary city. More than half of those arrested had no criminal convictions. At the time of the Chicago raid, ICE published a press release saying sanctuary policies forced ICE to arrest106 people "at-large" — meaning without a warrant, Castañon's counsel argues. 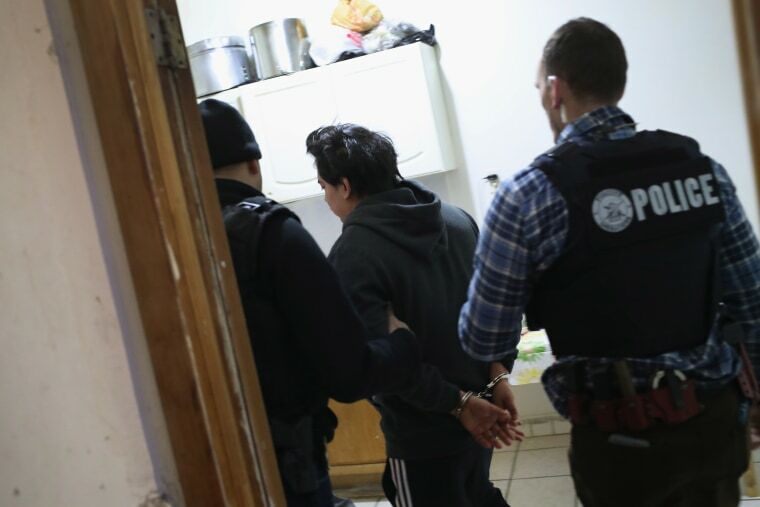 In 2018, ICE has issued press releases about 27 large sweeps, averaging more than 100 arrests each, according to data compiled by NBC News. Of these 27, nine gave a number or percentage of those arrested with criminal convictions and referenced sanctuary policies — and these had a higher rate of non-criminal arrests than the rest of the country. In the nine mentioning these policies, roughly 44 percent of those arrested did not have criminal records. Nationally under Trump, roughly 31 percent of those arrested did not have criminal records, a proportion that has more than doubled since the Obama administration. "There's no check on collateral arrests in this administration," said Tom Jawetz, vice president of Immigration Policy at the liberal think tank Center for American Progress. "The administration is not distinguishing between people who would sensibly be considered priorities and those that are simply encountered along the way." In one instance cited in the Chicago lawsuit, plaintiff "John Doe" says ICE officers pulled over his van because they said they'd observed low tire pressure. ICE has no jurisdiction to enforce traffic laws. On May 19, 2018, Doe says he was in the car with his boss and several other co-workers. Like Castañon, he also worked in construction and had lived in the Chicago area for many years. Doe assumed the officers were local police. The officers' vehicles surrounded his van so it could not move. When Doe's boss asked why the van was pulled over, officers said it was due to low tire pressure. Later, they asked Doe for identification, and he complied. Fleming says that because people generally want to comply with local police, when ICE agents do not identify themselves as ICE it makes immigrants more likely to hand over i.d. when, by law, they don't have to. "ICE knows that what they are doing is to trick people into providing information that is relevant to their civil immigration status," said Fleming. "If ICE thought it wasn't effective, why would they uniformly never identify themselves as ICE at the point of contact?" ICE spokesman Bourke strongly denied Fleming's assertion that ICE officers and agents routinely fail to identify themselves as such. Said Bourke, via email, "The use of 'POLICE' identifiers is consistent with numerous other federal law enforcement agencies — for the safety of ICE officers and agents as well as the public, ICE should be no different." ICE arrested Doe. ICE counsel says Doe is not a citizen or U.S. national and is "unlawfully present" in the country. ICE also produced a copy of a warrant for Doe dated May 19, 2018, the day of the stop, but Fleming says that as for Castañon, the warrant was written after the stop. In the motion to deny the plaintiffs' motion for a preliminary injunction, ICE counsel says that "even if any of the Plaintiffs could demonstrate that the arresting ICE officer lacked probable cause," it doesn't matter because none of the plaintiffs argue they are lawfully present in the U.S.
All of the plaintiffs are now out on bond, Fleming says. Asked about warrantless and collateral arrests, Bourke referred NBC News to prior public statements, and said, "ICE conducts targeted enforcement in compliance with federal law and agency policy."